“I have never been able to meditate. But Tama always takes me into another dimension. Her voice is so compelling. Her power and love come right through and pierce my heart every single time.” — Susan W.
“Tama has this gift of immediately helping me center myself and hear my own inner voice. This woman is a genius when it comes to helping you feel safe, connected, and totally free.” — Dave B. “Tama’s programs are always a cut above. In a sea of self-help averageness, Tama is the real deal. With intelligence, depth, and humor, her wisdom offers a really fresh direction that rocks my world every time.” — Michael G.
Listen here for a sample. Are you ready to make living your dreams a priority? Or uncover what you REALLY want? 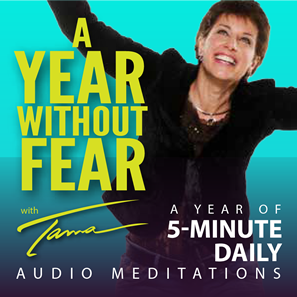 This Daily Mindset Shift program is based on Tama’s book, A Year without Fear: 365 Days of Magnificence. Each selection is designed to shift the self-talk and old beliefs that corrode your potential. Each selection helps you set an intention for the day. This creates your day. And your days create your life.Tama has been a coach and national workshop and retreat leader for more than 20 years. She’s seen what helps shifts people from fear to clarity, confidence and action. 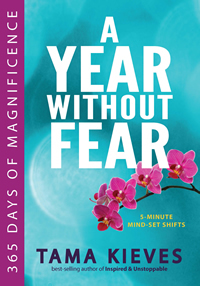 Now she’s offering these mindset shifts and transformations in power-packed morsels that allow you to shift in just 5 minutes a day. Set to powerful music, Tama’s one of a kind meditations will instantaneously take you deeper into the love within you. 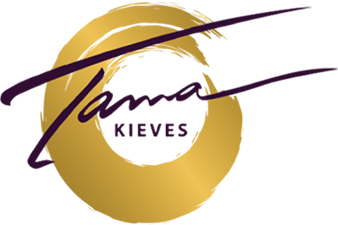 This program is designed to help you discover and live your dreams. Love those around you more deeply. Forgive yourself. Stop doubting your own brilliant instincts, even when you’re surrounded by the noise of the world. Experience peace of mind, even in challenging circumstances. Tap your unstoppable strength. And more. It’s a year without fear. Who would you be if you practiced listening to your own astonishing potential, every single day? The inspired power within you can accomplish anything at any time. Let this be your time. Tama both reads the passages to you and then guides the meditation/journey. For years, students have raved over the power of Tama’s meditations, set to music, that guide you instantly to a deep love and presence within you. Now she has created 365 of them. Each one presents a targeted inquiry to help you uncover the direction and truth that already exists within you—about anything in your life. Unlike a book or CD which requires YOU to pick out the passage and commit to it. Each day, your focus and journey is delivered to you. You can’t jump ahead, just like in life. You are far more likely to stay committed to yourself in this deliberately measured way. And you are given a new opportunity every single day, as in life. With her gift for language and imagery, each day you listen to an inspired way to see things presented as your focus for the day. This includes a specific coaching intention for your day. Then you are guided on a 5 minute meditation, which you can extend if you like. Each day teaches and guides you to listen to your own brilliant inner voice and take inspired steps toward your true desires. Just one of these mindset shifts could change the course of your year. Just one of these journeys can accomplish more than a session with a coach or therapist. And you get 365 of them! Order today and your Daily Mindset Shifts can start tomorrow! K…, of Dreamfire Music, is an intuitive artist who creates collages of sound with her voice. Often compared to Enya, her layers and texturing are warm and welcoming. She records in the middle of the night, when the world is still and the soul is open. This expansive music will help you to go deeper into the realms of your own inspiration and calling.